Home comfort isn't just about temperature. 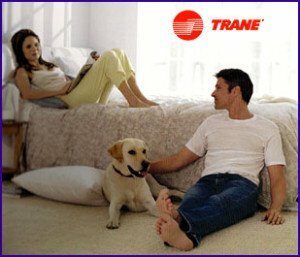 Trane sets the standard with indoor air quality solutions such as whole-house filtration systems that can address everything from humidity to air purification to provide a cleaner and healthier environment. Backed by over 90 years of industry-leading innovation and manufacturing excellence, Trane has developed superior technology to remove more airborne allergens than any other air cleaning system. It's called CleanEffects™ - and it's only from Trane. CleanEffects™ is 8x more effective than even the best HEPA filter, and 100 times more effective than a standard 1" filter. 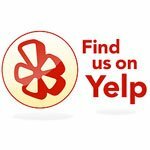 No replacement filters to buy, ever! 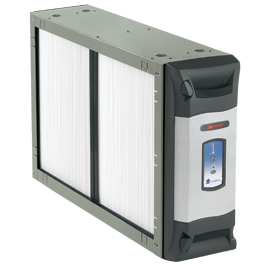 Trane CleanEffects™ has a ten-year limited warranty on the system’s electronics, and a five-year parts limited warranty on the system filters. Extended warranties are available for TRANE CleanEffects and also the rest of your Trane system. Ask us for details. Easy to clean filters – just vacuum or rinse once every 3 to 9 months (depending on usage). Quiet operation - not a noisy or intrusive standalone appliance. Quietly and efficiently distributes clean air throughout your whole home. Trane CleanEffects™ is integrated with your cooling and heating system and does not require a separate fan. 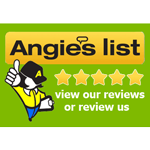 Can be installed as part of a new Trane cooling and heating system such as a XC95 Three-Phase Gas Furnace or XL20i Heat Pump, or can be added to your existing system. Installation can take less than an hour, giving you cleaner indoor air quickly. Not all particles in the air are created equal. There are particles of many different sizes, which cause many different effects when present in your home’s air. Particles like dust, soot, mold spores and bacteria are often .3 microns. That’s the size at which allergens can get deep into your lungs because they aren’t filtered well by your nose and throat. TRANE CleanEffects™ removes tiny particles like these, effectively reducing the potential triggers for asthma and allergy attacks. With TRANE CleanEffects, the majority of irritating particles like dust, pollen, pet hair and dander, dust mites, mildew, lint, fungus, most tobacco smoke, cooking grease, even bacteria, will be removed from the filtered air. Our revolutionary technology can trap allergens down to .3 microns in size. What’s more, the particles in the “particulates” category smaller than .3 microns will adhere to larger particles—meaning that TRANE CleanEffects can get rid of them as well. 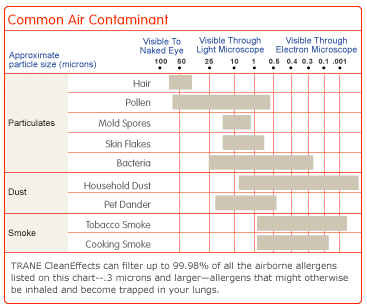 What this all means is that TRANE CleanEffects is effective at removing the particles that are most likely to affect your family’s comfort and health.